Is Antares about to spark a guitar playing revolution? Auto-Tune is best known as a vocal processing tool, but with ATG-6, developer Antares is bringing its pitch detection technology to the world of guitars. Currently in development, ATG-6 is being billed as an "entirely DSP-based suite of functions that offer everything you've always wanted from a guitar". At its heart is a technology known as Solid-Tune Intonation, which promises to constantly monitor the precise pitch of each individual string and make the necessary adjustments so that every note you play is always in tune. The precise specs of ATG-6 are still to be confirmed, but Antares has set up a preview page on its website. The official press release is below. 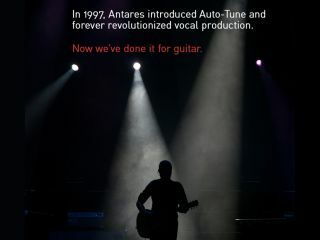 Antares Audio Technologies has posted a web preview of their new ATG-6 Auto-Tune technology for guitar. It can be found at: http://www.antarestech.com/atg6/index.shtml. The current preview provides an overview of the ATG-6 technology and focuses on its revolutionary Solid-Tune(TM) Intonation system. Future updates will focus on additional ATG-6 capabilities. Incorporating world-renowned Auto-Tune pitch detection and manipulation along with Antares' proprietary modeling technologies, ATG-6 is an entirely DSP-based suite of functions that offer everything guitarists have always wanted from their guitars, along with capabilities never imagined possible. From flawless intonation to astonishing tonal flexibility to alternate tunings that open up entirely new areas of inspiration and creativity, ATG-6 technology seriously expands the flexibility and range of the electric guitar while letting players continue to leverage their hard-won traditional technique. The ATG-6's Solid-Tune Intonation system addresses the eternal challenge of maintaining perfect intonation as a guitarist moves up and down the neck and fingers complex chords. With the Solid-Tune Intonation system, an ATG-6 equipped guitar constantly monitors the precise pitch of each individual string and makes any corrections necessary to ensure that every note of every chord and riff is always in tune, regardless of variables like finger position or pressure or physical limitations of the instrument. As a result, listening to a guitar with Solid-Tune is a revelation, offering a purity of intonation that has simply never before been possible. Additionally, Solid-Tune is smart enough to know when players intend to manipulate pitch, so they can play bends and vibrato exactly as they always always have. Solid-Tune Intonation even makes it easier to bend to the right pitch every time. "We're extremely excited by the potential of ATG-6 technology," said Marco Alpert, Antares VP of Marketing. "In the same way that Auto-Tune revolutionized vocal production, we feel confident that ATG-6 technology will have a similar impact on playing and recording the electric guitar. We look forward to sharing more details about its many capabilities over the coming weeks and months."